The perfect gift for any occasion! CHOCOLATE CHOCOLATE: The True Story of Two Sisters, Tons of Treats, and the Little Shop That Could. 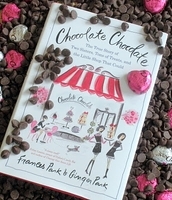 From award-winning authors & proprietors of Chocolate Chocolate, Frances Park & Ginger Park finally penned their delicious memoir! Their uplifting and inspiring memoir is the perfect gift for any occasion. The Park Sisters have been humbled by the global response to their memoir. They've received countless emails from California to Wisconsin, from Milan to Seoul praising their story. Frances and Ginger were carefree young women when the sudden death of their father turned their world upside down. 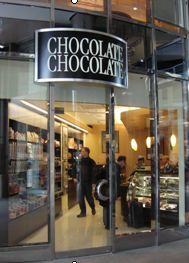 Reeling from their loss, they turned to one another-- and the comfort of good chocolate --to numb their pain as they figured out way to create a shared future. The answer turned out to be as simple as their childhood dream: open a chocolate shop. 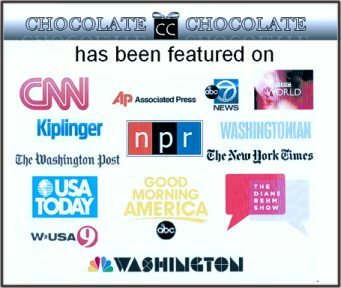 In January 1984, Chocolate Chocolate opened its doors in downtown Washington, D.C. But it was a rocky road to success; thanks to a crooked contractor, the walls of their shop literally crumbled around them and building a clientele wasn�t easy; many days the sisters consumed more chocolate than they actually sold. Thankfully, over time, with much hard work and perhaps even a divine dose of chocolate magic, their no name shop was transformed into a nationally celebrated boutique. Along the way the sisters found love, penned books, and befriended a charming entourage of customers whose own stories were as luscious as the bonbons that had them coming back for more. Quote from readers: A big THANK YOU to Ginger who was so kind to us today. "Chocolate Chocolate" was the book my book club read this month and five of us made a field trip in to the store this afternoon for some heavenly chocolate. It was so nice to meet Koomo too. We had a terrific time!